Are all maps published with adverts? No. If you are on the Professional Plan or higher, you won’t see any adverts. How do I remove Google Ads and ZeeMaps branding from my published maps? Choose ‘Map’ then ‘Remove Ads or Branding’ from the map menu. (If you are on the Professional Plan or higher, you won’t see this option because you don’t have any adverts or branding on your maps). 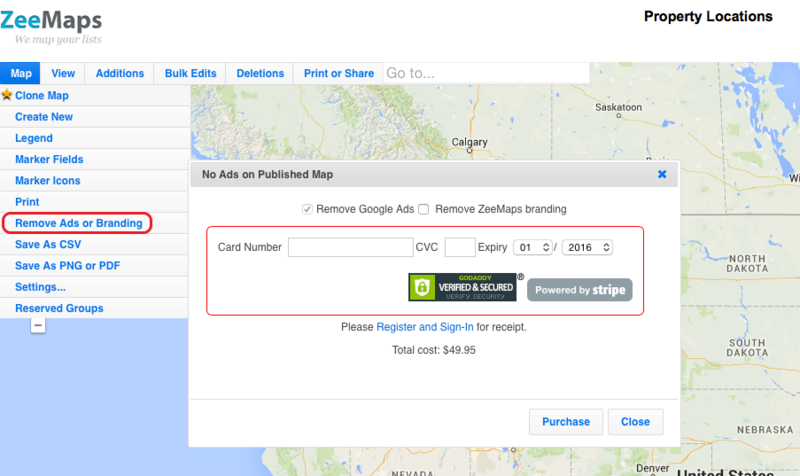 Select whether you’d like to remove Google Ads and/or ZeeMaps branding, and a price will come up. Enter your card details and hit ‘Purchase’. This is a one-time fee that lasts for the lifetime of the map. Can I remove ads from multiple maps together? No, you have to remove ads from each map individually. But if you subscribe to the Professional Publisher or Enterprise Plan then none of your published maps will show adverts.